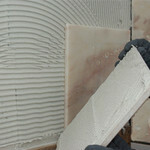 Using a notched trowel at a constant angle provides an even distribution of adhesive onto the substrate. If the tiles are all bedded with a similar force they should be at the same height with only minimal unevenness. However, if the substrate is not properly leveled, there is a higher chance that some edges will dent and stand out of the final surface. Localized deep holes, may result in a bed thickness that exceeds the specification for a thin bed adhesive application. Patching and leveling such holes and slumps can be time consuming if they are numerous. In some instances, when tiling over a layer of existing ceramic tiles, the mentioned problems may be combine all at once, which will require that some of the tiles to be removed. Non calibrated natural stones are stones that have been split along their natural fracture planes rather than machine cut. The result is a stone that varies in thickness and varies from other stone pieces. These types of stones require an adhesive that can be applied at a greater thickness than normal. Surface to be tiled should be sound and clean, free from dust, oil, loose laitance, grease, molds, or any contaminating material. Applicators must ensure that the tiles are clean, free from dust and contaminants that could impair adhesion. The tile adhesive must be totally cured before the tile grout application. If the walls are not properly aligned or of poor quality, it is necessary to reskim using weberpremix skim coat or weberep 360 FFR to ensure better results. It is particularly important to ensure a solid flat surface as a concrete floor on which tiling can be applied. Tiling of uneven surfaces can be done with webercol plus, webercol bond or webercol flex. For large format tiles bigger than 900 cm², it is recommended to use the back buttering method. For extremely large tiles bigger than 3600 cm², only a flexible tile adhesive like webercol flex should be used. Back buttering the tiles is recommended. It is recommended to have a minimum joint width of 2 mm around the tiles. Grouting should be done at least after 24 hours of fixing tiles, using weberepox easy, weberjoint perfect or weberjoint. The faster problems are noticed, the easier it will be to replace or fix a misplaced tile, since after 24 hours tiles cannot be easily removed as the adhesive would have started to harden.